Planview is a system that offers businesses a vast range of unique functionalities and features. The list includes agile project management, budgeting, collaboration, customization, learning and support, notifications, reporting, resource management, task management, and other conventional project management functionalities intended for small and medium businesses. With Planview, businesses and organizations are given a platform that enables them to spot and address viable opportunities, and then prioritize and effectively leverage their limited resources like manpower and money. Senior managers, business owners and other people at the top can use the app to make critical decisions on projects they handle. Planview ensures they have all the tools and features they need to see the whole picture and then drill down to the minutest detail to be able to assess advantages and disadvantages, prioritize efforts, and make the best decisions while deploying limited resources on a regular basis. Without Planview, even top management individuals can be at a loss, come to poor decisions, and eventually suffer the economic consequences. Planview Enterprise offers businesses and organizations a comprehensive, feature-rich platform that can handle every step of and areas of resource and portfolio management. The system boasts tools and capabilities that address tasks and issues that come up during intake, planning, execution, and up to delivery. Whether they are projects, applications, products, or investments, Planview users are equipped with the features they need to integrate the different phases so that data remains significant and aids users to make trade-offs and configurations as often as required. 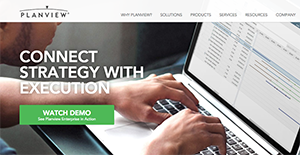 Users can seamlessly capture demand, prioritize portfolios, maximize their capacity, execute and realize plans, and manage end-to-end financials with Planview. Planview also comes with rich analytics and reporting features. Users have easy access to information, can picture out their data, share it with others, and work together to come to smart business decisions. To help users see and digest their data, Planview provides them very visual metrics. The platform’s intuitive and scalable interface enables users to effortlessly create views and tables using the wizard-based approach. Drill down reporting and guided analytics help visualize business information including big data. Creating ad hoc reports, adapting to custom processes and controls, and accessing the platform via through Microsoft Outlook, Excel, or SharePoint is easy, whether you are using a desktop or iPad. Planview Enterprise is an ideal system for companies and organizations operating in various industries, including information technology, product development, finance, and services. Organizations have unique wants and requirements and no software solution can be ideal in such a scenario. It is useless to try to find an ideal out-of-the-box software product that fulfills all your business wants. The wise thing to do would be to modify the application for your unique needs, worker skill levels, budget, and other elements. For these reasons, do not hurry and subscribe to well-publicized trendy systems. Though these may be widely used, they may not be the ideal fit for your specific requirements. Do your groundwork, check out each short-listed system in detail, read a few Planview reviews, call the seller for clarifications, and finally settle for the application that provides what you require. How Much Does Planview Cost? We realize that when you make a decision to buy Project Management Software it’s important not only to see how experts evaluate it in their reviews, but also to find out if the real people and companies that buy it are actually satisfied with the product. That’s why we’ve created our behavior-based Customer Satisfaction Algorithm™ that gathers customer reviews, comments and Planview reviews across a wide range of social media sites. The data is then presented in an easy to digest form showing how many people had positive and negative experience with Planview. With that information at hand you should be equipped to make an informed buying decision that you won’t regret. What are Planview pricing details? What integrations are available for Planview?